I’ve been making my own yogurt for a while now and it’s a very easy process. All you really need is a heavy pot and thermometer to have success. I use a cast iron dutch oven. The problem is that you often have too much yogurt on hand – if that’s possible. This recipe is a way to combine two current excesses, my yogurt and garden fresh cucumbers. 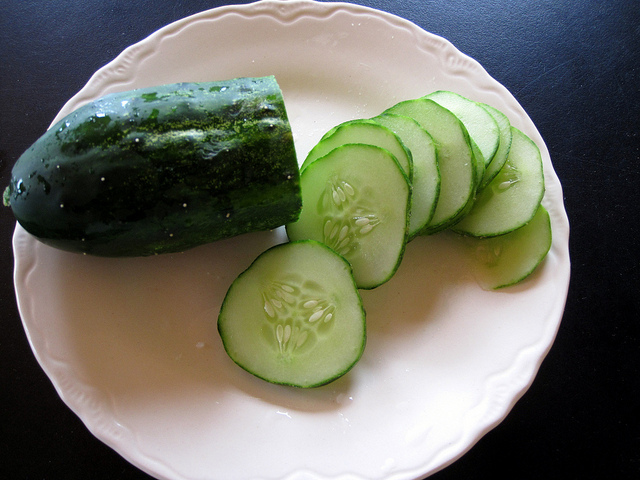 Cucumbers are coming into season now and can be almost as prolific as zucchini. 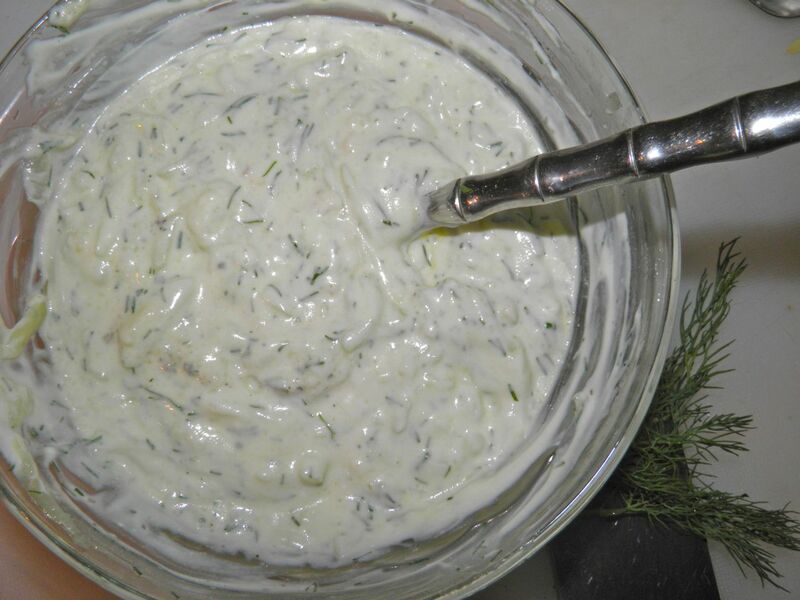 Tzatziki is a dill, garlic, yogurt and cucumber concoction that is a staple of Greek cuisine. It is served as a meze (appetizer) and also in souvlaki or gyros. It is always served chilled. This tangy, garlicky sauce is about as refreshing as you can get for summer, or any time of year. It is often served just with pitas (for a great recipe recipe search this blog for Arabian Pita Bread). It is also an excellent topping for lamb burgers, or just as a great addition to a backyard gathering. Tzatziki is also amazing with salmon or white fleshed fish. 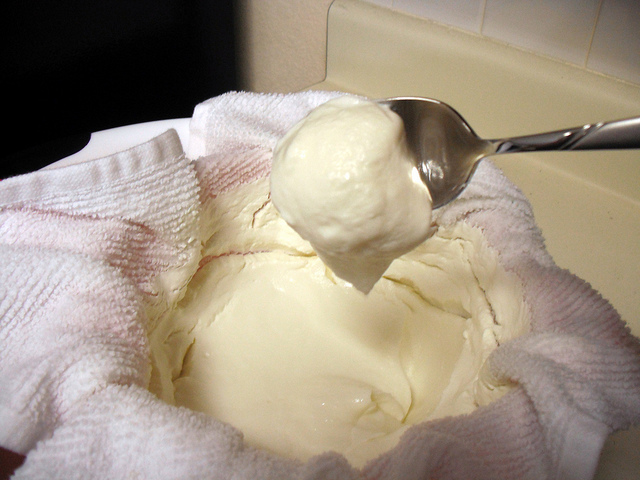 If you want to make your own thick yogurt, here’s a very easy method. Heat the milk and skim milk powder to 185°F. Stir so the milk doesn’t catch to the bottom of the pan. Use a thermometer. It doesn’t come to a boil. Let the mixture cool to 110°F. This may take 1 hour. Keep checking with a thermometer. Once cool, stir in the yogurt. Cover the pot and keep at about 80-100°F. I sit the covered pot on a heating pad. Let it culture for 12-24 hours. The longer it sits, the tangier it will become. Strain the yogurt through a piece of cloth, and drain for about 1 hour. Some whey will seep through and the yogurt will become thicker. After draining, put the yogurt in a container and refrigerate. This yogurt should be thick enough to stand a spoon upright – certainly thick enough for making great tzatziki. Refrigerating for several hours helps meld the flavours. If your yogurt isn’t thick, you may have to place it in cloth in a colander to drain. The yogurt must be able to have a spoon stand up straight in it without falling over. If you drain the yogurt you will lose volume so use more than 1-1/2 cups. This will add 1/2 hour to your overall time, so buy Balkan or Greek style yogurt. If you make the yogurt as above you won't need to drain it. Peel and seed the cucumber. Coarsely grate the remaining flesh and put in a sieve. Press the cucumber in the colander with the back of a spoon or small bowl to extract as much liquid as you can. Mince the garlic. Add all the ingredients together in a bowl, mix well and refrigerate until needed. This was great in lemon chicken wraps, which I will post soon.